Twenty minute blog post returns! I’m not sure when I first became aware of Tim Winton. He’s been writing since the 1980s, and as far back as 1995 he was shortlisted for the Booker Prize for The Riders. 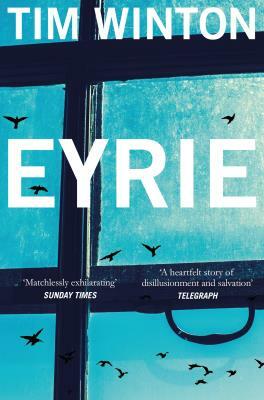 But an afternoon bookshop browsing this summer – when I should have been writing far more important things – led me to Eyrie. Winton’s most recent novel is set – like much of his writing – in Western Australia. But forget the glamour of Perth and yachting. This is a gritty, painfully down at heals, Bargain Booze sort of Australia, of failed marriages, crime-riddled tower blocks and faded dreams. The protagonist of the novel, Tom Keely, has failed too. Once a promising environmental campaigner, Keely has lost all and ended up in a half-squalid flat. His marriage over – we’re never quite sure why, though hints are given – Keely suffers from mysterious black outs. Disoriented, addicted to sleeping tablets, Keely treads the narrow path between sanity and deep depression, lonely and without purpose or hope. Then, by chance, he meets a neighbour, Gemma, and realises how he once knew her in childhood, when Keely’s principled parents had given refuge to troubled children such as Gemma. But whereas Keely’s life brought a large house, a lawyer wife and media appearances, by her forties Gemma is already a grandmother with a drug addict daughter in jail. Hardly the stuff of the latest thriller – and, to be frank, not much happens – but give this a chance. Winton has a particular gift for dialogue, capturing Australian patterns of speech in a way which gives his writing both a sense of realism and insight into character. Indeed, his style shifts between the profane and vernacular and the poetic and biblical, being at once brash and rich in allusion. All the time, Winton writes with a highly empathetic understanding of all those caught up in the story, and a painful, self-recognising sort of humour. On one level, this is a novel about class, plotting the gulf in attitudes between the middle class Keely and Gemma, reduced to shift work while her six year old grandson sleeps alone each night. But Winton’s canvas is much broader, and the novel becomes an exploration of love, redemption and hope. There are no simple solutions. Somewhere these disappointing misfits in the darkness might not see a great light, but there are the faintest of glimmers. In short, this is a superb novel and one of my top reads of 2015. ← Is it time to abandon Amazon?